Two weeks after my daughter was born, one Sunday morning my husband and I decided to get the kids out of the house and take a drive because we were all getting a little “newborn baby stir crazy”. Some how we ended up lost in Mission, KS (about 15min. from our house) but we didn’t mind since it was a beautiful sunny morning, windows were rolled down and the country music was blasting. We happened upon a store called Diaper Daisy and decided to stop. We were immediately welcomed in and greeted by the wonderful owners, even though the store wasn’t officially open yet. They were getting ready for their grand opening but took the time to give us a tour of the store and talk to us about cloth diapers. We have always been interested in cloth diapering but were overwhelmed with where to start and after talking with them for an hour, we excitedly walked out of their store with our first stash of cloth diapers! From that day forward we gave away our daughter’s disposable diapers and never looked back! 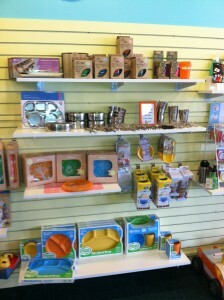 I was also impressed with their wonderful selection of Organic/BPA-free toys, teethers and children’s feeding products. Whether you cloth diaper or not, are pregnant, a new mommy, need to find a toy, gift or diaper bag,buy an organic matreesss, lead-free paint etc. this store has it all! 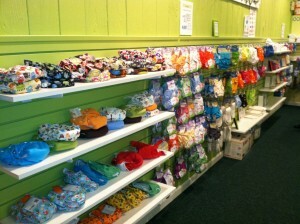 They also have a beautiful line of nursing clothes as well as cloth and natural feminine and breastfeeding products. The vast majority of their items in store are available on their website as well! For the past 6 months I have made this store my “second home” and love attending their classes and have met so many wonderful mamas! I have been to their baby wearing, breastfeeding and cloth diapering mama groups and love being surrounded by like minded mamas. Since having children I have become very passionate about natural parenting and really appreciate the attention and high standards this store gives to the type of products they sell. A few weeks ago I had a pregnant friend visit me from California. 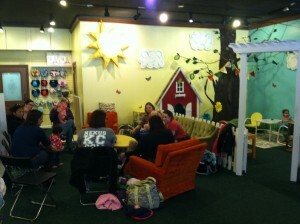 Of course the first thing we did was drive over to Diaper Daisy and check it out. I gave her a crash course in cloth diapering and natural baby products and sure enough she also walked out of there with her first stash of cloth diapers. 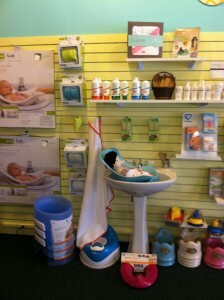 She was so impressed with their products that she decided to register with Diaper Daisy. She found the website and the registry process very easy and straight forward. Even though her baby shower is in California, she is excited that Diaper Daisy has free shipping on orders over $35 and her friends and family will be able to get her natural baby products (and cloth diapers!). The biggest mistake I ever made was registering at Babies R Us (I will never go back there again!). I sure wished Diaper Daisy was around when I was pregnant! Green Toys My son loves his Green Toy Trucks. Green Toys are made from 100% recycled material, and are free of BPA, Phthalates, and PVC or external coating. Organic Farm Buddies This is my 6 month old daughter’s favorite toy. The raddles are made from 100% organic cotton fabric, hypoallergenic sustainable corn fiber filler and with recycled paper! Keekaroo This is a great highchair that can last for a long time and even be used by an adult. The Wooden Chair is made from Rubber wood and the finish on the Height Right Wood High Chair is a standard plant based lacquer. This company also makes an awesome changer called the Keekaroo Peanut Changer and the reason I love it is because the solid shell limits bacterial growth and it’s impermeable to fluids. Aden + Anais Bamboo Swaddle Blanket These are the only swaddles that really worked for us! The breathable muslin material make it an extremely versitle blanket/swaddle. I use it as a swaddle, blanket, car seat/stroller cover, “mat” on the carpet, emergency diaper pad etc. Diono Radian Car Seat- This is one of my favorite car seats because of it’s safety features (steel alloy frame) and you can fit three of them in one row! Beco Gemini Baby Carrier– I love my Ergo (which Diaper Daisy also sells) but the Beco carrier was so darn cute and comfortable that I am really wanting to add it to my carrier collection! I love the design and the patted material! I also like that, just like the Ergo, the thick waist belt allows the weight to be on your hips rather than your back…and for someone with bad back issues, that is crucial for me! Planetwise Wet Bag-I love this company’s beautiful wet bag designs, waterproof inner lining and how easy it is to hang with it’s snapping feature.. I have four of them and here is where I put them: changing table, back of Master Bedroom door, diaper bag and back up (just in case!). If you do not cloth diaper, it is still great to have one of these in your diaper bag when that big blow out comes or a place to store your dirty diapers until you can get to a trash can. The smell is well contained, when zipped! 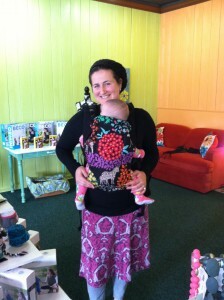 Sophie the Giraffe– What can I say, every baby (especially, one that is teething) should have a Sophie! It is made of 100% Natural Rubber (phthalates Free) and food paint. My daughter plays with her Sophie for hours at a time! Go visit their beautiful store, awesome classes and easy to use website…Plus, enter to win a $25 gift card from Diaper Daisy! I would buy a Tots Bots Diaper! I would buy some more cloth diapers in some cute prints. Love the customer service of The staff!! I would buy my first set of cloth diapers- have been wanting the opportunity to dive into cloth diapering!! A better question is what would I not buy at Diaper Daisy! But if I had to pick just one thing I’d buy some of the natural art supplies that they have, I want the egg dying kit! More cloth diapers & a new carrier. I would buy some cloth diapers! I would buy the new Bum Genius printed diapers! I would buy more diaper covers. I would buy a highchair or booster seat. I love the GroVia hybrids! Love Diaper Daisy! I need another undercover mama! I would buy Bum Genius 4.0s that I’ve been wanting to try! Possibly a bum genius freetime diaper! chewbeads! diapers! toys! the possibilities are endless! I’d get a BumGenius Freetime! I would buy a Ju Ju Be BFF!! I would add a couple of Applecheeks covers to my stash. This store looks Mama Lovely! Hope to visit soon! I would buy bumgenius diapers! I would get a new carrier & some new diapers! I would love to stop by the store to see what they have!! If I win the gift card, I would go for cloth wipes, or maybe a Sophie giraffe for the new baby coming in May! I would buy a Diono Radian! I would like to find a natural teething toy for my 8 mo old! I would love more cloth diapers!! It is actually really worth remembering that 45% of the portion of coconut oil every day. diet is one of the main benefits of using coconut oil. Just want to say yur article is as amazing. grab your feed to ksep updated with forthcoming post. Thankss a million and please carry on the enjoyable work.